February 4th, 17:50. We leave the runway at Dublin Airport, starting our journey to South Asia. Five countries, six months. First stop - India. What can I say? A lifetime wouldn’t be enough to explore this exciting, diverse, crazy country. Don’t believe me? I’ll show you. February 5th, 11:40. Our plane touches down in Delhi Airport. Following a loooong wait in immigration we finally get outside where we are to supposed to meet the driver organised by our hostel. We wait. He’s nowhere to be seen, so we contact the hostel who get through to him. We wait some more and he finally comes. I never quite understood what happened, but I think that he left thinking we weren’t coming. After a 40 minute journey in the back of a van in which we thought we might die at any moment because here they don’t seem to have any rules of the road, we finally make it to our hostel, located right in the heart of New Delhi, hidden 20 metres or so down a little alley, away from the madness of the street. After checking in and chatting with the owner, we made our way up the three flights of stairs to our room. We collapsed onto our bed and quickly fell asleep, exhaused from the 13 hours of travelling. Back in Ireland when we were still in the planning phase of this trip, a lot of what we read online strongly recommended against going to Delhi first, as for many people the city can be overwhelming. We decided to ignore this advice, mainly because we already had our flights booked. Looking back, we’re happy that we had to start our trip here. 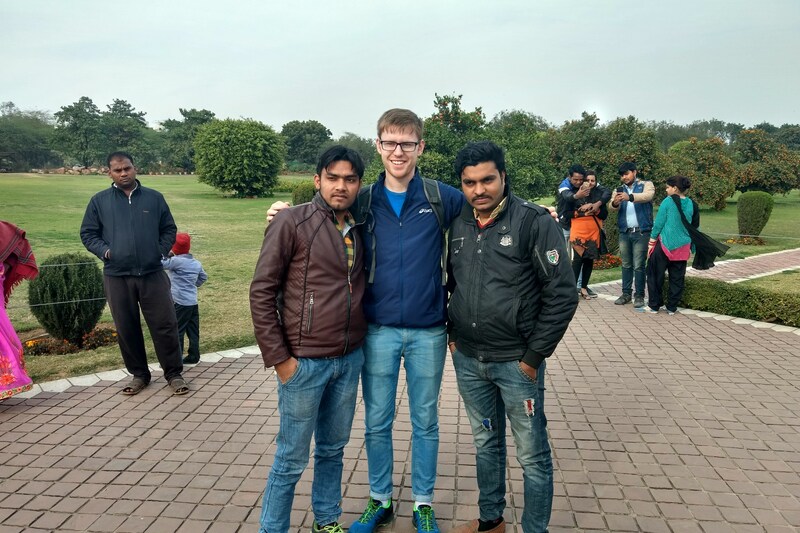 We wanted a culture shock, and Delhi is probably one of the best places in the world to find one. Outside of Delhi, everything seemed kind of calm and easy in comparison. The best way I can describe Delhi is an assault on all of your senses; the strong smells that change every few steps, the constant noises from the horns and locals going about their business, extreme poverty alongside extreme wealth. 19 million people (4x the population of Ireland) squeezed in to an area of less that 1,500km², India’s capital has it all. There are plenty of ways to get around Delhi. There are buses, taxis, tuk tuks, the metro, and of course walking. Some are easy, some are difficult. These are the ways we tried and can confidently recommend. We had a couple of days to explore the city and be your typical tourists taking photos of everything. Luckily the hostel staff were helpful and told us that the best way to get around is the metro. A one day tourist card is only Rs 100 (€1.27), or Rs 250 (€3.17) for three days. That will get you to within a few minutes walk from most places in the city and it has an unlimited number of uses. The metro is definitely the easiest way to get around, as long as you don’t mind tight spaces. If you decide that you want to give it a go, check out this detailed map we found on Wikipedia. 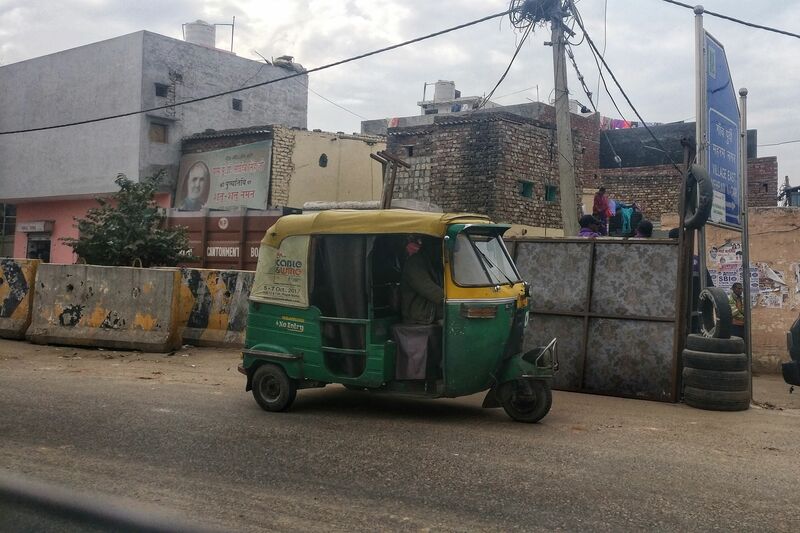 Auto rickshaws, better known as tuk tuks, are a fun and inexpensive way to get around. If you’ve been to Asia before chances are you’ve already been in one. I’d recommend that you download Uber to remove a lot of the hassle involved in trying to get to your destination and for a fair price. If you’re old fashioned or if you just want to brush up on your bargaining skills, you should first have an idea of how much it should cost. As of 2018 a tuk tuk in Delhi is Rs 25 for the first 2 kilometres and around Rs 8 per kilometre after that. Delhi Traffic Police provide this handy calculator to tell you how much your fare should cost. Be aware though: unless the taxi is using a meter you will always pay more for it than the locals. Just another reason to use Uber 😉. 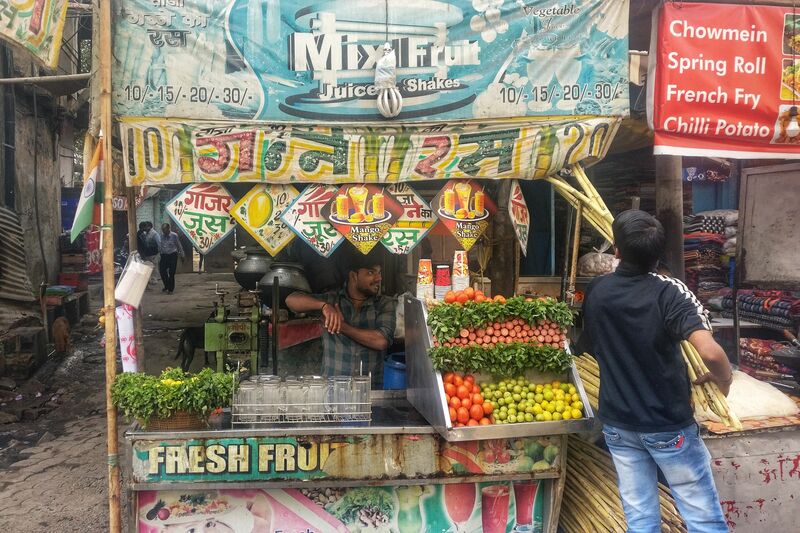 If you would like to walk in Delhi, you need to be very aware of your surroundings. Vehicles will drive just about anywhere and will often get waaay too close for comfort. Probably the toughest thing to overcome when you are new to the city is trying to cross roads. It took us a while to become confident at it. Observe how the locals do it, or better yet go along with them. Traffic won’t stop - the best thing to do is cross bit by bit - it’s perfectly normal to wait in the middle of the road for another opening. We only had two full days to explore the city so we had to choose wisely when deciding what to see. Entry: Rs 250. We really enjoyed it here. There are many different buildings and monuments in varying degrees of ruin. Entry: free. This is a nice, modern temple. It looks impressive from the outside, but once you get inside there isn’t much to see or do, but if you are nearby it’s worth checking out. Entry: Rs 35. It’s okay. Nothing really interesting to see here. It’s really cheap so you wouldn’t be left out of pocket after but it probably isn’t worth going out of your way to visit. Entry: Rs 500. A massive fort made from sandstone in the 1600s. It’s definitely worth venturing inside these old walls to witness what was once the home of the Mughal dynasty. Entry: free. Located right in the centre of Connaught place, Central Park is a good place to go if you want to an escape from the the chaos of the city. We met an Indian guy here called Jahn and chatted for about 40 minutes. 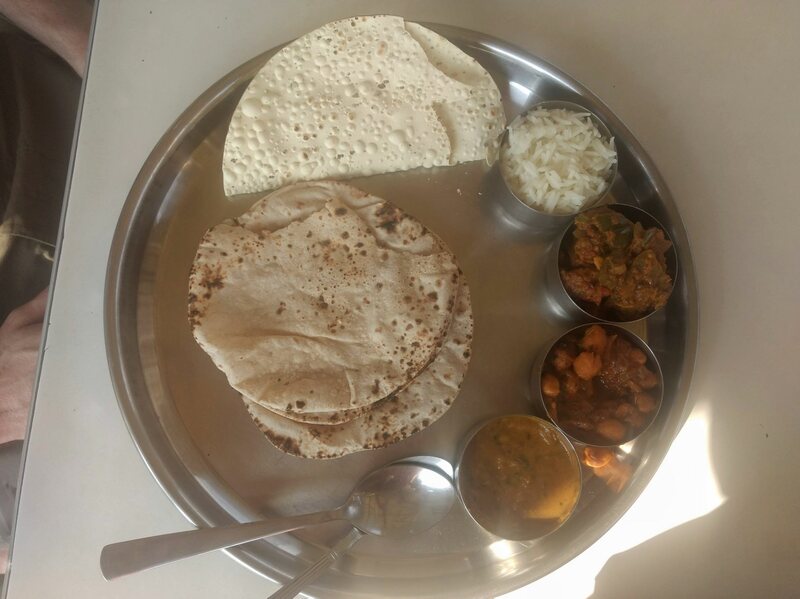 He also introduced us to a popular dish known as a thali, which was so nice it became our go to lunch for the rest of this trip. Jahn, we are eternally grateful. It may be the capital, but Delhi is far from the best representation of India. It is extremely tough to do what should be simple things, two days here is more than enough. It was time for us to move south east to our next destination. If I told you that our next destination was Agra would that mean anything to you? Maybe, but probably not. Most people who visit Agra only come here for one thing - The Taj Mahal. You’ve heard of that, right? Come back next week and I’ll tell you all about it.